I saw a lot of bursting water balloons on flickr (it seems as balloons are a popular highspeed subject), all looked very similar and I wanted to create something different. I haven’t seen gel colored balloons before.. So here we go.. I have a hiviz sound trigger, which is attached to an arduino board. The arduino board is connected to the RF602 sender, which will trigger the flashes. The laptop is just needed as power supply for the arduino and in case I have to modify the code.The main reason for using the arduino is, that I can put a delay after the flash is triggered to ensure that the flash isn’t triggering a second time.. The second reason is that the delay is adjustable with an accuracy in the range of milliseconds.. The preflash delay was set to 0ms in this setup. For this setup I used the following approach. I’m shooting in a dark room on long exposure mode with a an aperture of about F10, during the long exposure I fire the flashes. (This will freeze the action). As bullet I used a 4mm sphere (which is designed for bracelets. I put a needle through the hole and attached it with some tape. I placed the flashes, where I wanted them. It turned out that I get the best result, if the flashes were at 3 and 9 o’clock. The flashes were turned to 1/32 to get a short flash duration (around 1/20’000s). I cut a hole into the boxes to avoid wet flashes. 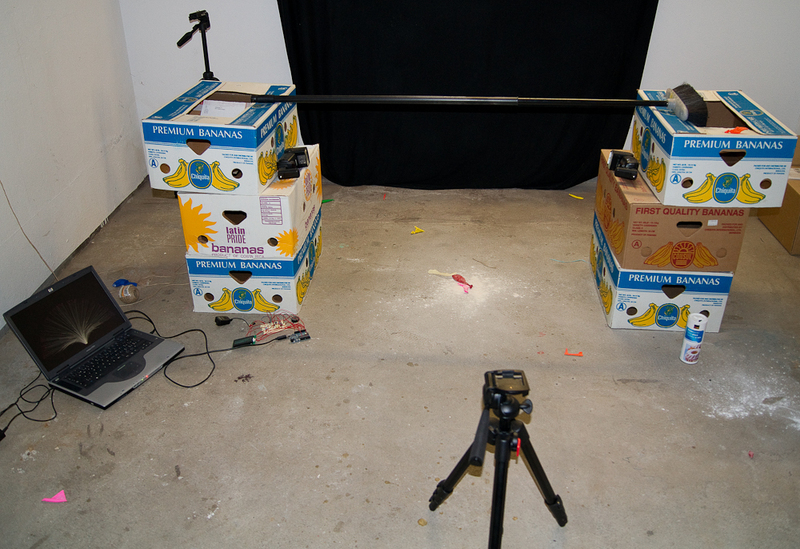 I can easily turn the boxes and adjust the direction of the flashes. I filled up the balloon with water and attached it to the broom (any scantling will do, the broom was the best thing I had) with a cord. I put the cam on manual focus and then I focus the subject (thanks to new magnified live view this is easy). Afterwards I turn of the lights and take a shot at 6 to 8 seconds, which should be totally black.. If something is reflecting you know where to place a cardboard or a blanket or something.. I sticked carton on all my windows in my basement to have a completely dark room. When the dark image is a dark as it should be, I take a second shot with the flashes, to check whether the lighting of the main subject is okay..
After the good preparation this is a no-brainer. Press the shutter, aim, “shoot” and enjoy. I noticed, that it is good to have so air on the top of your ballon, otherwise there will be no bang which will trigger the flashe. The flashes will trigger as soon as the water is already in the collecting tank, and thats much to late. I did another shot with blue/mangenta gels and yesterday one with dark blue / red. The conclusion of this test is, that lighter colors will work better. If you want to shot with that colors you may have to adjust aperture, ISO or in worst case put the flash to 1/16 (which will result in a longer flash duration and more motion blur)..
Just some basics. Crop, adjust levels, saturation and some sharpening. I’m open to suggestions, constructive feedback, criticism (both, about the setup and this post, (as this is my first howto on dps)) and would like to her your comments.. If anything is not clear or you have any question, or need some detail information about the trigger / arduino, feel free to ask. The flashes are inside the top most boxes (to avoid wet flashes) and there is a collecting tank below the balloon on the floor.